The model MC-2 was the first mainstream model EECP® device introduced by Vasomedical Inc. 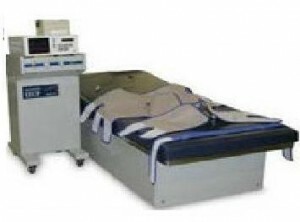 The MC-2 was one of the most successful model EECP Therapy devices from Vasomedical because this unit is accredited for being the model used in much of the early clinical trials for Angina such as the MUST-EECP study. The MC-2 is known for having a strong squeeze and delivering effective therapy. The MC-2 now is a rare device to find, but still exists. This model is an analog system with a limited user-interface. We rate the MC-2 the lowest on the footprint scale as it has 3 large components – treatment platform (bed), compressor unit, and the control console. The MC-2 the least comfortable unit existing on the market. This device is known for the “slamming effect” which is a result of the unit not regulating the pressure delivered to the patient when irregular heartbeats are present. This system has no operating system. Every control of this unit is manual. The unit has no digital integration other than scanning the 8 second strip and manually imputing into an EMR. System has 8 second strip printed on a thermal printer. The strip indicates the ECG, inflation/deflation timing and arterial waveforms. All calculations are performed manually by the therapist. Vasomedcical is known for having comfortable cuffs that deliver a good squeeze. This is an early model system where the noise factor was virtually not a factor in development. The MC-2 is good and bad. Some unit run forever, some do not. The MC-2 has service available from the manufacturer Vasomedical but the cost of service is at a premium. The MC-2 was expensive in the early years, but since it was discontinued, the price for a used one is low if you are capable of finding a complete functioning system. We have seen them for sale as low as $8,000 but rarely complete.